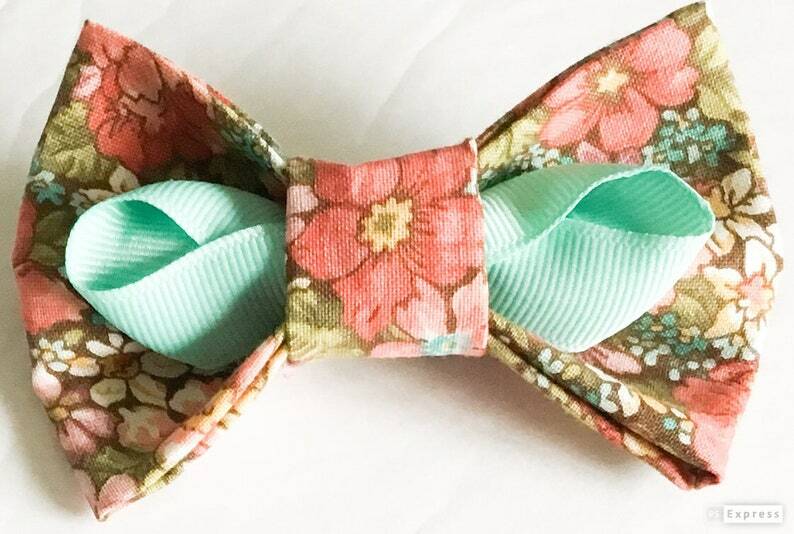 This listing is for a Pink, Aqua, and Salmon Floral Bow only which can be attached to both a dog or cat’s collar during the Spring or Summer months. The floral bow attaches to the collar by way of wraparound velcro which has been added to the back. I have also added felt to the back of the collar bow as additional support for the velcro attachment. The velcro can be trimmed down to the width size of your dog or cats collar. All bow ties & flowers can be made out of any of the fabrics in my shop. If you are looking for a specific design style, please contact me via email regarding this. All flowers are fabric made and all bow ties are made out of fabric with an added layer of interfacing. The interfacing works to give the bow tie additional support and shaping. Reinforced stitching is also used on all seams for added strength and durability for the bow tie. Get 10% off your order when you spend $75 at this shop. Discount shown at checkout. Delivered quickly and is exactly what was promised! Bought this collar for my Airedale pup to wear on St. Patrick's Day. Very durable and well made. The clasp can handle an energetic pull without opening. Great collar! My boy looks fantastic! Payment is due at time of order. We accept Paypal, Visa, MasterCard, Discover, American Express and Etsy Gift Cards. Please ensure that you have measured your pets neck correctly before ordering so that you do order the correct size as refunds are not accepted on custom made orders unless a product is damaged or defective upon receiving, We will refund in full or exchange the product if this happens.. Please contact me via email prior to sending back a product. Items purchased are made to order and products will be shipped out normally within 4 to 7 business days via USPS First Class Mail. Shipping times may vary due to holidays and intake of orders. International orders will ship out within via USPS First Class International Mail. Delivery time is normally within 10 to 14 business days. Please allow for delays in delivery. If you are in need of quicker shipping, please message me as I can expedite the shipping time. Please measure your dog's neck prior to ordering to ensure you are ordering the correct size. Please make sure to contact me if you have any questions regarding sizing.